What seniors do. Click on the image for larger view. It’s not just in schools that students are laying back. From the Washington Post: “Over the past half-century, the amount of time college students actually study — read, write and otherwise prepare for class — has dwindled from 24 hours a week to about 15, survey data show. […] declining study time is a discomfiting truth about the vaunted U.S. higher-education system. The trend is generating debate over how much students really learn, even as colleges raise tuition every year. Some findings from the survey: “While seniors spent their time in similar ways across a few activities (relaxing or socializing, co-curricular activities, and commuting), time spent preparing for class varied. 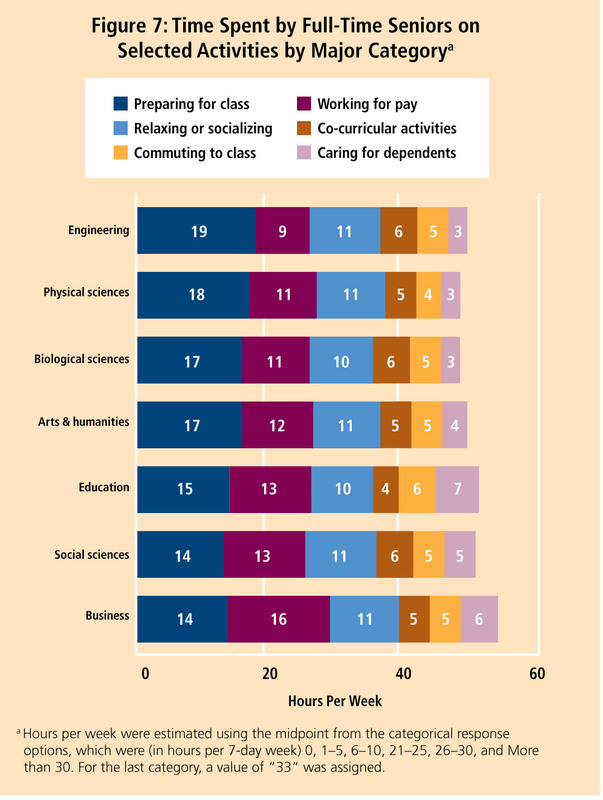 For example, seniors in engineering averaged about 19 hours per week preparing for class, while their peers in the social sciences and business averaged five fewer hours per week. Different curriculum requirements may partly explain this gap. For example, engineering courses may require more time-consuming activities such as design projects and laboratory work. The report, Fostering Student Engagement Campuswide—Annual Results 2011, details results from a 2011 survey of 416,000 first-year students and seniors attending 673 U.S. colleges and universities. The report’s theme illustrates the value of connecting student engagement results to specific campus programs and units to encourage greater collaboration to improve the quality of the undergraduate experience. “The central message is that providing opportunities, activities and environments supportive of learning and student success is a concern that should permeate the campus” said Alexander McCormick, NSSE director and associate professor of education at Indiana University. Perhaps transofrming students into consumers isn’t a good idea. That would have been a much more accurate tag line Elizabeth. Oh dear….. I hate to say this…… as it is a terrible cliche…. but, times have truly changed! I don’t understand it…. college costs have always been high….and since costs are high…. why aren’t students making sure they get their money’s worth? Here goes…. when I was in school…… I studied all of the time…. and never missed a class. I spent hours in the “stacks” of the library…. staying until midnight when the library closed. After all…. I was paying for half of my tuition, room and board, books, etc. I did not feel like wasting my money by not taking advantage of what I was paying for. What on earth is going on in the minds of students nowadays? They complain about costs…. but do not appear to be particularly willing to put in the work and take advantage of what they are paying for. Do they really like wasting all that money? I honestly just do not understand at all!